The alliance formed between the Virginia Council of CEOs and the Virginia Chamber of Commerce earlier this year was an important milestone for VACEOs. The move gives VACEOs members access to the largest business association in Virginia and the leading non-partisan business advocacy organization for long-term economic growth in the Commonwealth. 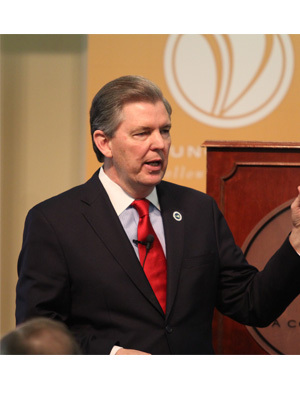 The Virginia Chamber has the ear of each incoming Virginia governor, said Virginia Chamber CEO Barry DuVal at a recent Quarterly Luncheon. And Council members were ready and willing to speak up, given the opportunity. Using a unique live text polling application, members shared their views on issues including education, workforce training, economic development, transportation, healthcare, technology and innovation, energy, manufacturing, the environment, and military and veterans affairs. This data will be combined with the opinions of other regional leaders and industry experts from across Virginia over the next year. The Virginia Chamber will then produce its Blueprint Virginia 2025 business plan for the Commonwealth and present it to the next governor after the 2017 election. What did YOU do during your last business luncheon? If you weren’t helping shape the next governor’s economic development policy, you were dining with the wrong crowd. VACEOs members have access to national thought leaders on a regular basis. Check out other member benefits to learn more! This “What’s On Our Minds” moment is from the VACEOs Quarterly Luncheon presentation “Blueprint Virginia 2025,” with Barry DuVal (Thursday, March 23, 2017).